The angel voice responded “Don’t be stupid, its only two weeks until the marathon, get in the car and go home”. In truth, I didn’t want to go home: I felt good, I was out on the trails on a stunning spring day and I was enjoying the solitude. I pressed on. I was running solo for a change, and as much as I have enjoyed the company of my teammates on long runs this year, I think I needed three hours alone with my thoughts in such a beautiful place. It hasn’t been a straightforward week. It started with family illness and rushed visits to hospital last Sunday; work has been fraught and stressful recently and my blistered toe was slow to heal. Three weeks out would be the perfect time for the final pre-marathon long run, but last Sunday my toe was too painful. On Monday morning, I got up at 5:30a.m., fully intending to run 20 miles before starting work. After 5 miles of 8:30 min/miles shuffling and with a throbbing toe, I ran past my office and tossed in the towel. Poor I know, but sometimes when you are hurting and absolutely hating the run, there is no point in continuing. Thankfully, by the end of the week, the World seemed a nicer place again. Good Friday meant it was the Salford 10K – an annual fixture for me, and a race I really enjoy. I don’t want this to sound wrong, but it’s a proper old fashioned ‘club’ race. No big corporate sponsor, no £30 entry fee, no closed roads – just a mass of very good Northern runners, most in very short shorts, fantastic volunteer marshals and a great wholesome atmosphere. A flat 2 lap course and a windless mizzly day presaged fast times. Despite my down mood at the start of the week, a good hard interval session of 5 times one kilometre on Wednesday lunchtime gave me thoughts of a possible fast time, maybe even a PB. Looking at my previous fast 10Ks, like Salford (36:50) and the Abbey Dash (36:21) in 2014, I realised that I have tended to run the first mile a little too fast, and had faded towards the end of the race. Although a 10K race is almost the definition of what a threshold effort is, you still need to measure the effort correctly. I decided to back off just a tad for the first mile. I was well back in the high quality field, but still ran 5:49, feeling I had left plenty in the tank. I managed to lock in this pace and kept passing other runners steadily as the miles ticked over – 5:50, then 5:50 again. As I passed the 5K halfway mark, a marshal yelled out “17-58!” I still felt OK – I was working hard, but felt I could probably maintain the pace for a bit longer. Mile 4 is ever so slightly uphill and was a bit slower in 5:56, but then I managed to run a 5:50 and a 5:51 mile to bring me in sight of the finish. There was a knot of about 5 other runners just in front of me and I decided to absolutely bury myself for a final 200m sprint in order to pass them and burgle a few places. My finish time was 36:06 for a new PB, which I was obviously pleased with. I was probably even more pleased with the way I paced the race, which was nearly perfectly even. 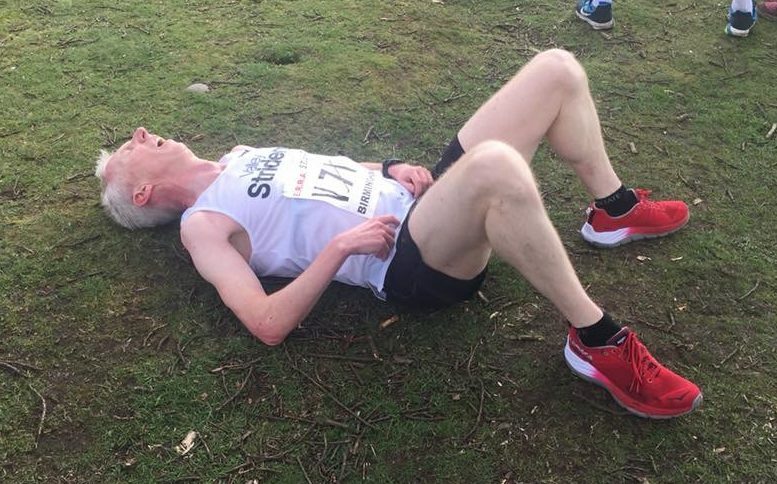 Having broken 18 minutes for the first 5K at Salford, what could stop me smashing my 17:44 5K PB at Woodhouse Moor parkrun on Saturday morning? Well, hubris for one thing! Although I gave it full gas, Friday’s effort was still in my legs and I faded to finish in 18:14. The course is very busy these days, which is wonderful, but I did experience a few traffic issues on the third lap, probably costing 5-10 seconds. Back on my long run on Sunday, I was finally tiring after 24 miles on the final little loop. Realising that only vanity was telling me to run a marathon two weeks before a marathon, and spying an ice cream van in the car park; I decided to stop at 25 miles and sit in the sunshine enjoying the perfect post effort recovery fuel – a ‘99’ ice cream and a can of full fat Coke. Despite the extortionate price (£3.20!!! ), I watched the birds over the water with warm sunshine on the side of my face. It’s been a hard block of training since Christmas, but now I can relax, at least for a few weeks and hopefully enjoy the fruits of my efforts during the cold and dark of winter.